Dormant for five months including the interruption by Hurricane Irma that wiped out the road racing calendar including the annual College Classic Series, road racing in the territory roared back to life on Sunday, with the staging of the 12th Deloitte-Ogier BVI Sunrise Half Marathon. The race that attracted 54 participants including 10K runners and a corporate relay, returned to start at the Tortola Sports Club for the first time since 2009, but, using a different course, since the A. O. Shirley Grounds was severely damaged, during Hurricane Irma. Julius Farley who was the top local runner in the 2016 edition and fourth overall, took control from the outset and set the pace on the two laps from the Tortola Sports Club in Pasea to the Sensus Gym in Pieces of Eight, with his main rival Reuben Stoby, laboring in tow. 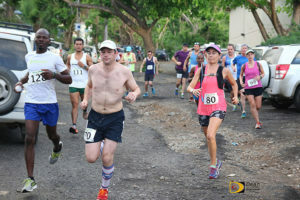 Farley, who enjoyed a 45 seconds lead at the Sensus Gym turnaround, turned up the heat on the second lap, turning a 2 minutes and 11 seconds advantage after the first lap into a six minutes victory, covering the course in 1 hour 32 minutes and 06 seconds. After the hurricanes and since there were no 10K races, Farley said he had a few short runs the furthest being about six miles and that prepared him mentally for the race. Stoby who finished in 1:38.38, said Farley was probably the only person in race shape. Maria Mays won the women’s division in 1 hour 54 minutes and 01 seconds. Karen Fraser who finishes second behind Mays in 1:58.31, said her strategy was just to finish. 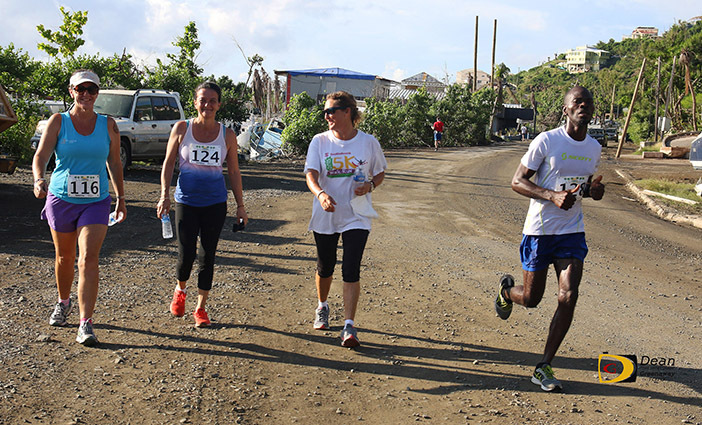 Race director Kay Reddy, sixth overall in 2:26.04, whose house, office and car were damaged, said what they have learnt is how strong the BVI is and she has gained so many friendships. Reddy thanked the media for its role in promoting the event. Individual results. Men: 1. Julius Farley, 1 hour 32 minutes and 60 seconds. 2. Reuben Stoby, 1:38.38. 3. Paul Mellor, 1:41.12. 4. Tom Lillyma, 1:51.59. 5. Patrick Thompson, 2:03.11. 6. Adrian Dale, 2:04.25. 7. Sergio Dantes, 2:05.02. 8. Owen Walker, 2:07.39. 9. Richard Morris, 2:10.19. 10. Mark Field, 2:10.40. 11. Justin Blakmoore, 2:12.19. 12. Ray Wearmouth, 2:12.42. 13. Nick Quinn, 2:19.45. 14. Richard Marniotte, 2:20.04. 15. Kenton Jones, 2:33.22. 16. Bryan Jermyn, 2:42.32. Women: Maria Mays, 1:54.01. 2. Karen Fraser, 1:58.31. 3. Rosmond Johnson, 2:01.29. 4. Melisande Rowe, 2:05.51. 5. Karrina Snead, 2:19.45. 6. Kay Reddy, 2:26.04. 7. Natasha Ruscheinski, 2:34.25. 8. Samiriamis Sarkardei, 2:24.27. 9. Kerry Dos Santos, 2:24.28. 10. Anna Kinkead, 2:48.48. 11. Simpa Ganadillo, 2:52.27. 12. Nedy Ador Dionicio, 2:56.37.